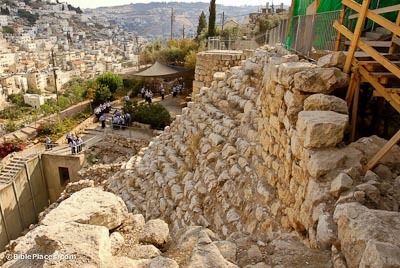 The City of David was very narrow; about 80-100m wide. The east side has a steep slope of about 60 degrees. Though smaller, steeper and more difficult for construction than the Western Hill, the City of David was chosen because of its water source, the Gihon Spring. 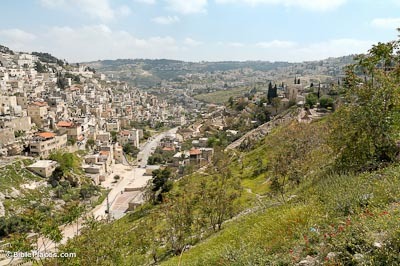 The Kidron Valley borders the city on its east side. Revealed in the excavations of Duncan and Macalister, Kenyon and Shiloh, this is one of the largest Iron Age structures in Israel. The structure has been revealed to a height of 60 feet (18 meters), and it is dated to the end of the Jebusite city (12th century BC). The structure probably supported a royal building, such as the king’s palace. Archaeologists now believe that they have uncovered part of that palace (NY Times article and photo). 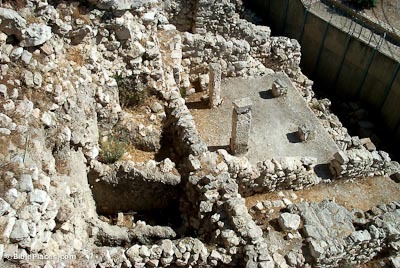 This is a typical Israelite four-room house. The outside stairway presumably led to the flat roof. The outside of Ahiel’s house (east) was poorly preserved, but the western side on the hill was well preserved. Inside the house were found cosmetics and housewares all from the ruins of 586 BC. 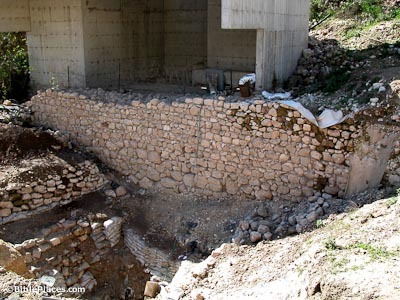 Recent excavations by Reich and Shukrun revealed a lower city wall from the late Iron Age (time of Hezekiah?) which ran along the eastern slope of the City of David near the bottom of the Kidron Valley. The modern structure above the wall is the new visitor’s center under construction to allow tourists to view the Siloam Channel. 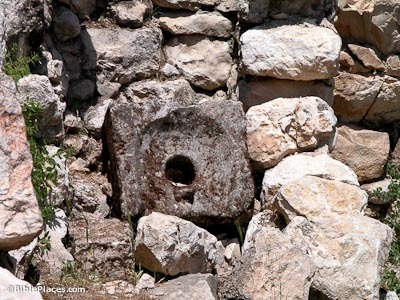 Four toilets have been found in the City of David – two in Shiloh’s excavations and two earlier. One found by the Parker Expedition was saluted as the throne of Solomon. Father Vincent said, “I fear its actual destination was at once more private and naturally necessary….” Another was found by Kenyon only a few yards from Area G.
Related BiblePlaces.com pages: Warren’s Shaft, Hezekiah’s Tunnel and Pool of Siloam. City of David (The Elad Foundation) Official site of the Jewish inhabitants of the City of David, explaining the archaeological sites and the renewed Jewish settlement. Site is beautiful but slow-loading. 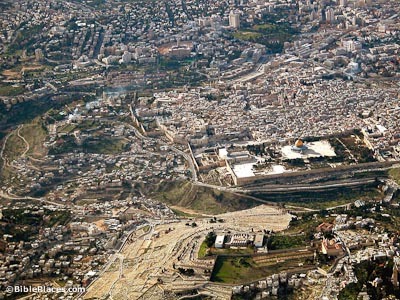 Jerusalem – The City of David (Israel MFA) Discusses archaeological findings in the City of David, in general. Discoveries from Area G are mentioned, but this area is not identified specifically by name. Copy of this page at Jewish Virtual Library. 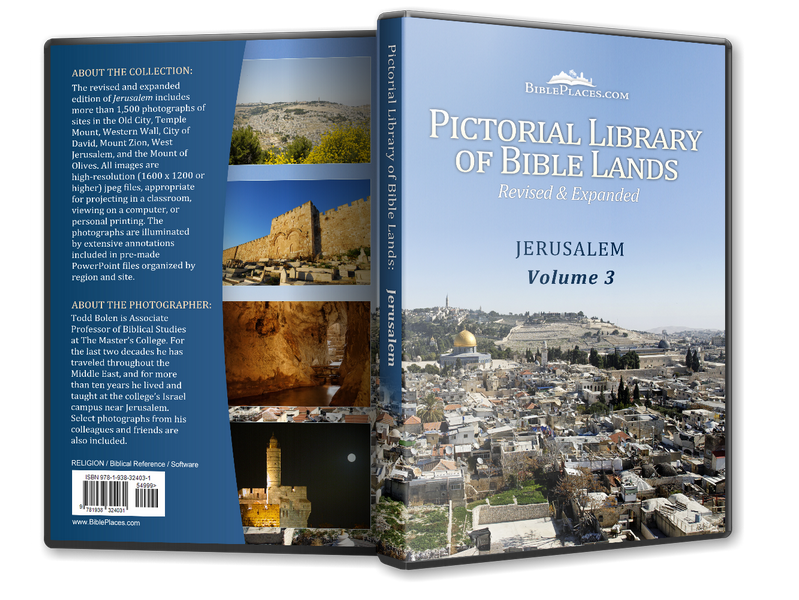 David’s Jerusalem Fiction or Reality (Personal Page) Features an article from Biblical Archaeology Review taking the minimalist position that Jerusalem did not exist in the time of King David. Area G (The New Jerusalem Mosaic, Hebrew University) Highlights the important archaeological discoveries made by Yigal Shiloh and his team in Area G, located in the City of David. Copy of this page at Jewish Virtual Library. Archaeology in Israel: The City of David (Jewish Mag) A detailed article providing insight into the City of David and its rich history. Citadel of David (Dig the Bible) Discusses the possibility that the “stepped stone structure” in Area G supported David’s citadel. Identifying King David’s Palace: Mazar’s Flawed Reading of the Biblical Text (The Bible and Interpretation) A critique by Todd Bolen of Eilat Mazar’s proposal establishing the location of David’s palace on the basis of 2 Samuel 5.